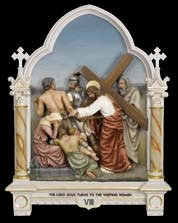 Download a pdf of the Stations of the Cross for Priests. It is not possible for any lay person, male or female, to grasp or comprehend fully the sublime vocation to the Sacred Priesthood of Jesus Christ or what it means to live out this calling. Each of us, in a very real sense, is called to live our lives walking with Jesus up the hill of Calvary. But it is a deep reality – a deep and sacred reality – that those ordained to the priesthood will, in persona Christi, lay down their lives for others. We, as laity, can never enter fully into the mystery of the life of a priest, but we might, on occasion, discover a “window” through which we catch a glimpse or gain a little deeper understanding of his life as he lives it on the road to Calvary with Jesus. 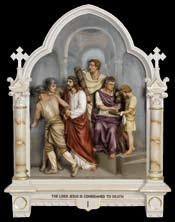 In writing these short meditations on the priesthood for the Stations of the Cross, we hope to offer you a “window” such as this to look through. As you make the Stations with these meditations, please consider offering them for the sanctification of all priests and their fidelity to their vocation. Leader: In the Name of the Father, and of the Son, and of the Holy Spirit. 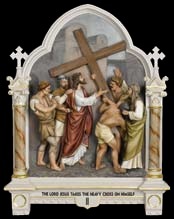 All: Lord Jesus Christ, You entrusted Your Church to the apostles, Your first priests, and willed that they and those who would follow after them should take up their Cross and follow You. To this day, this sacrificial nature of Your Holy Priesthood remains unchanged. Grant, O Lord, that, through the merits of these prayers and meditations on Your passion and death, Your priests may come to love You more deeply and follow You more faithfully. 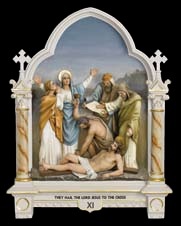 We ask this through the Sorrowful and Immaculate Heart of Mary, the first to make this Way of the Cross with You. 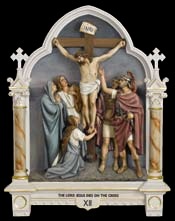 All: Because by Your Holy Cross, You have redeemed the world. Jesus, in God’s plan of salvation, offers His life on the Cross for us. Here is the priest at his ordination. It is a wondrous and happy day – yet, the priest, now alter Christus, that is, another Christ, will offer his life for the sanctification and salvation of souls. All: Have mercy on all priests. What a burden is laid on the shoulders of a man as he is ordained – the weight of our sanctification, the obligation to pray and suffer and sacrifice for our good – to do his part to help fill up what is lacking in the sufferings of Christ for the sake of His Church. What is it that caused Jesus to fall the first time? What causes a priest to fall? Could it be that there are so many demands on his time that he begins, little by little, to be torn away from his prayer life, his time with Jesus Who is the source of his strength?Prayer is his oxygen, the very life-breath of his priesthood. The sight of Mary consoled Jesus and yet increased His suffering because He knew how painful it was for Her to see Him this way. How necessary it is that every priest look to Mary –if only to turn his gaze upon Her from time to time each day– and let Her motherly smile console and encourage him. 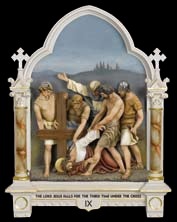 The word here is “compelled.” St. Luke says Simon was “seized”and the Cross was “laid on him.” The priest, one with Jesus, has come to the priesthood willing to embrace the Cross. How often, we, like Simon, have to be “compelled” to carry the Cross with Jesus, even “seized,” and then we do so grudgingly. Every ordained priest, no matter who he is, where he is called to serve, or how he responds to that call, bears the true imageof Christ – in his face, on his hands, on his very soul. 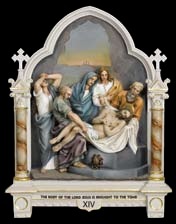 What can I do to imitate Veronica’s kindness to the suffering Christ? What can I offer a suffering alter Christus? Surely I can offer my prayers, perhaps a fast, perhaps an encouraging word or some other small kindness or sacrifice. 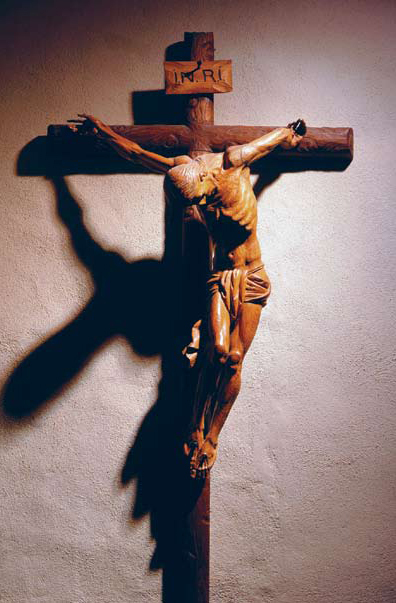 A second time, Jesus falls under the weight of the Cross.He is exhausted and in unfathomable pain.The priest who has been on his priestly journey for some time must be constantly aware of the snares in his path lest he fall into them. Of all these many pitfalls, perhaps the worst is loneliness– for this one can lead him into a host of other dangers. How very important it is that we pray for priests, especially those who are lonely, and how vital it is that every priest has the company and support of his brother priests. Above all,the priest must immerse himself in Jesus Who alone satisfies, fills the void of loneliness, heals wounds, gives strength, and fills him with love. 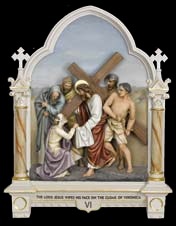 Jesus, in spite of His pain and fatigue, stops to console othersalong His path. How often the priest, weary, overwhelmed with responsibilities, struggling perhaps with his own pain, must reach out to ease the pain of others, to console and encourage, to be the mercy and compassion of Jesus at a deathbed, to redirect the course of a repentant sinner. And he may, in the midst of all this, feel acutely his own inadequacy. 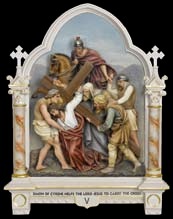 The road to Calvary is long and uphill. 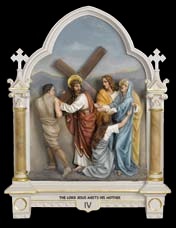 Jesus, near the end of His journey to Calvary, falls yet again. Surrounded by the brutality of the soldiers, He struggles to get up and keep going. What caused Jesus to fall this third time? What might cause a priest to struggle and fall again and again? And how should we respond? The priest is truly Jesus on the way to Calvary. 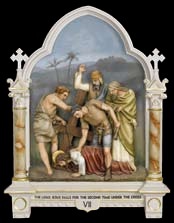 When he falls under his burden, the gossip, unkindness and scorn he receives, in truth, fall on Jesus Who is suffering in His struggling brother priest. Jesus could hear the mockery and scorn of those around Him andso can the priest. Will we love and pray a struggling priest back into service or let our words and actions keep him from getting up again? 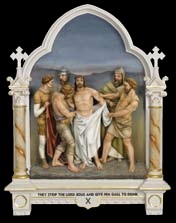 Jesus’ seamless tunic is stripped away from Him, causing His wounds to open and bleed. Naked and poor, His glory hidden, He stands before the crowd who does not recognize who He really is. The priest, too, stands before the people – in sacred vestments, in black suit and collar, in places of honor. He is set apart from others. Still, when all this “covering” is taken away – when he is imprisoned by godless regimes and stripped of his freedom, when he has grown old and is stripped of his health and ability to serve, perhaps even when he has fallen into sin and is stripped of his own dignity – yet, he remains clothed in the sacred “garment” of the priesthood, and so shall he be for all eternity..
Jesus is nailed to the Cross. He hangs in agony, suspended between Heaven and Earth, suspended between two thieves –the one who reviles Him with disdain and the other who begs for mercy. 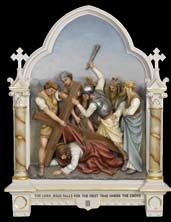 The priest, also nailed to the Cross by the very sacrificial nature of the priesthood, is suspended between Heaven, which he experiences in the Mass, and earth, which he experiences in the daily living out of his vocation. He, too, experiences those who revile and ridicule him and those who beg for mercy. United to Jesus, he must turn his gaze to the Father in Heaven. Jesus’ “hour” had finally come. It will come for every priest,too. And as Mary receives each priest as a special son on the day of his ordination and remains at his side throughout his life of ministry, so shall She receive into her arms every faithful son at the hour of his death. Jesus has completed His ministry on earth. By His Cross and Resurrection, He has set us free. He is the Savior of the World. 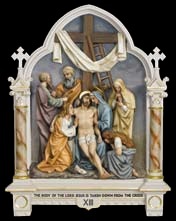 The priest, like Jesus, will go to the tomb someday.Through the power of the Cross and Resurrection of Jesus, he, too, through his ministry, has been able to set people free – free from their sins, free to recognize Jesus as Savior, free to enter into the Kingdom of God. We have several resources available to help you pray for priests and vocations. We thankfully accept donations to continue our ministry.